Grateful Dead Baja Hoodies have arrived! 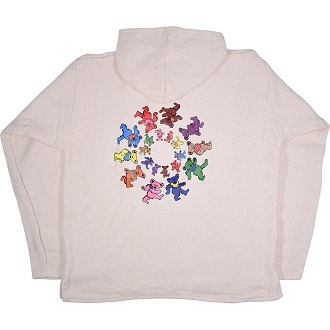 They are the classic natural colored Mexican baja hoodie printed with a spiral of dancing bears on the back, and a red dancing bear on the upper left chest. Brushed inside for extra softness our baja hoodie feature a front pocket to holds your stuff our keeps hands warm, V-neck and over head hood, breathable recycled fibers for warmth and comfort.